Metal Planters for the Garden or Indoors - Design Led Planters Ora Home Ltd.
Ora, the leading supplier of planters and accessories. Our polished aluminium collection is a real eye-catcher among the design planter collections. The shiny surface â€˜absorbsâ€™ the environment, reflecting it back again with full conviction. It is a work of art in its own right, but also an artist who creates a valuable addition to the environment. 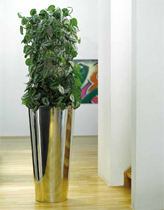 Polished aluminium is strong and can therefore be shaped into elegant forms, like the planter with a unique six centimetre-wide top edge that curves inwards in a smoothly flowing line. The wall of the planter is only two millimetres thick. As a result of their low weight, these planters are extremely easy to handle. They can also be used together with a wheeled base, making it possible to change the layout of flexible interiors in less than no time. 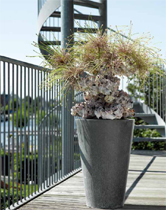 A perfect surface makes polished aluminium planters an excellent choice for indoor use. The collection contains both low and tall models that combine perfectly with one another and with attractive greenery. All planters are handmade by genuine craftsmen, who have clearly mastered traditional techniques. The perfect planter for outdoor use! Not too heavy, but weighty enough not to be blown over. The beautiful weathered look is the ideal counterpart to a contemporary design style, but is equally at home in romantic interiors. Galvanised steel has a wonderfully rustic look, but featuring contemporary qualities: a perfect finish, durable and unique. Below the characteristic surface is a shiny metal object. Special treatments create the gentle, blended appearance layer by layer. Exposure to the elements will only further enhance this unique appearance. Our galvanised steel planters have been treated against rust, though some minor rusting may occur. The range consists of a variety of easy-to-combine shapes and sizes. The extremely high temperatures to which the planters are exposed during production result in minor variations in detail, making each and every planter truly unique. The captivating vitality of these planters enhance any and every environment. Exposure to the elements gives zinc its unique look. It is an attractive, natural material that is not too smooth. Lightweight and therefore easy to bend, cut, fold and weld, the flexibility of zinc can clearly be seen in the beautiful handmade planters in our collection. when used in a shop or food service establishment, where planters need to be brought outside and inside again daily. For more than three thousand years, zinc has had a strong reputation due to its excellent decorative and functional qualities. This popular metal is also a desirable alternative today. It is often used in modern architecture for elegant exterior details like zinc roofs, rain gutters and drainpipes, as well as indoors as an attractive interior decorative element. 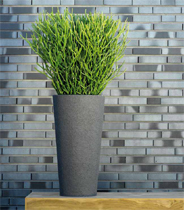 Our collection of zinc planters is as broad as its possible uses. Various classic and contemporary shapes are available, including square, round and conical. Heights vary from 25 centimetres to a 1 metre, making the planters suitable as both desk planters and showpiece items in spacious interiors. Zinc is unique in that it comes in three attractive surface finishes: classic light-coloured, elegant dark grey and the exclusive â€˜Jewelâ€™. We have over 20 products in our Metal Planters range. Download our catalogue for the full range. Please call for prices. Tel: 01444 257007. Placing your order couldn’t be easier, either email or call us! Most products are available for delivery within 5 days of ordering. Placing your order couldn't be easier, just email or call us! Please enter your email to keep receiving the Ora newsletter.